Post on our FB page to see if anyone is training for the Freezer in your area! We have created a very basic 10 week training plan just for the Beaver Freezer! The links to the plans are at the bottom of this page. Because there are SO many different ability levels out there, we decided to start with some very basic times. For this plan, you should be able to walk and jog for 30 minutes. This doesn't have to be jogging the entire time, just a combination of the two. You should also be able to ride a bike for 45 minutes (any speed). For the triathlon training plan, you should be able to swim at least 25 yards (one pool length) and complete 20 lengths or 10 laps (500 yards) in one swimming session. Again, speed doesn't matter. This plan is set up so your longer workouts take place on the weekend. You can rearrange the days as needed as long as you keep them in the same week. To begin, you should see how far you can walk/jog/run in 30 minutes. Additionally, you should time your 500 yard swim (if you are doing the tri). For the bike, just see how far you can go in 45 minutes. This will give you a starting point so you can see how you have improved over the next 10 weeks. The schedule is set up so you do one work out a day and get to take Monday as a rest day. This means you don't have to do any workouts on that day. If you need to move your rest day to a different day, go right ahead. We want this to work for you! As always, please consult with your physician prior to initiating any exercise program. The plan is set up so you do 2 swim, 2 bike and 2 run workouts a week. If you want an extra rest day, you can combine 2 workouts. You could do a morning swim and an afternoon ride or some other combination. Later on in your training, we will add in some "Brick" workouts where you bike and then run. This is to practice those transition legs. Running after biking can feel completely awkward and just down right silly, but with a little practice, come race day you won't feel as wobbly. The swims are set up in yards. The standard lap swimming pool is 25 yards long. This means 500 yards is 20 lengths. For a swim workout, we don't expect you to just go swim 500 yards and get out. Especially those of you who are there yet. We want you to go swim as many as you can in a row and then rest. Then repeat that distance if you can. For example, you hop in the pool and swim down and back then need to rest. After resting for a minute or less, swim down and back again. Continue to do that until you reach 500 yards. For the "Drill Focus" swims on Fridays, the idea is to work on your form. You will do the same number of yards as you did earlier in the week, but this time you should do one length of a drill and one length of focusing on what that drill was meant to fix. For drills and what they focus on, you can check out our swim work out page or look up swimming drills on YouTube. 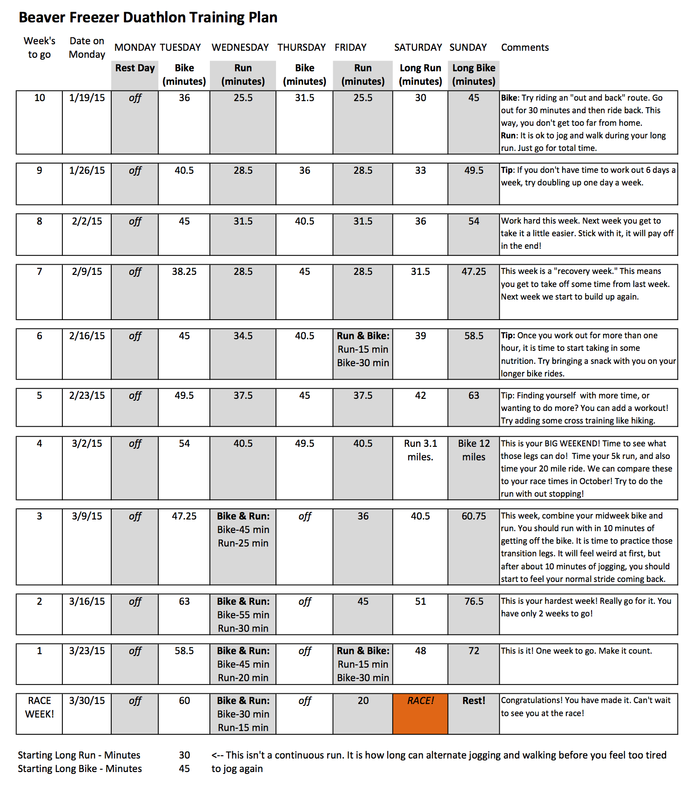 All of the bike and run workouts are based on time except 2 that are 4 weeks out from the race. During these workouts, you will want to complete the specified mileage and check your time. You can compare that to your time on race day. This should give you a good idea of how your training is going. The plan is set up so you do 3 bike and 3 run workouts a week. If you want an extra rest day, you can combine 2 workouts. You could do a morning run and an afternoon ride or some other combination. Later on in your training, we will add in some "Brick" workouts where you bike and then run. This is to practice those transition legs. Running after biking can feel completely awkward and just down right silly, but with a little practice, come race day you won't feel as wobbly. In addition, for the Du, there is a workout to test your run to bike legs. If you feel like you need more practice with this, feel free to do some more combination workouts during the week and then give yourself an extra rest day. For both plans, the "30 minute long run" is really 30 minutes of what ever you can manage. If this means you jog for 3-4 minutes and walk for a few to catch your breath and then run again, that is just fine. The more you practice, the more you will be able to jog before taking a rest. It usually takes about 2 weeks before you really start to feel better, so if at first it doesn't seem like you are improving, be patient. It will come with time and practice.